The Coffee Cup Revolution is a demonstration depot event being planned for Victory Square in downtown Vancouver on Monday, October 6th, 2014. Vancouver binners are carrying out a street-level environmental action, reminiscent of United We Can’s efforts in the early 1990’s. That work helped shift social behavior and responsibility and resulted in the expansion of the deposit laws for beverage containers. The ignition key for this event will be a “pop-up” depot in Victory Square that will pay binners 5¢ for each of those ubiquitous used paper cups that we see strewn across the urban landscape every day. The spark behind this action is an exploratory venture, The Binners Project which is being supported under Cities for People, an experimental program for advancing urban innovation. 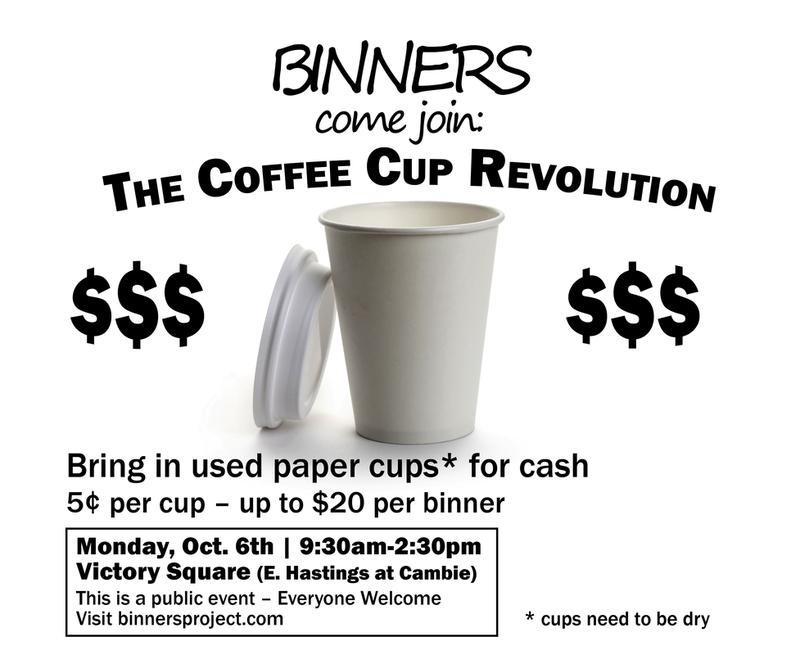 For its première event, the Binners Project has intentionally identified the “disposable” cup as the symbolic evidence of a conspicuous shift in consumer habits over the past several decades. Binners get up close and personal with our urban waste every day so they see first hand, the effects of this shift. Some older binners recall a time when people used to sit together in cafés chatting over steaming pottery cups of hot coffee. Today, in a busy wireless age, with paper cup in hand, we pursue our goals on the go; leaving a trail of cups, lids, stir sticks, and maybe even some of our values behind us in the dust. A symbol of our times, but so much more, paper coffee cups have become a serious environmental problem. They litter the highways and byways of our cities, each one of them, an aesthetic assault to our collective unconscious. While it is difficult to estimate with absolute accuracy just how many of these cups we go through every year, the most recent statistics we could find suggest that conservatively, it’s well past the 1.5 billion mark. And that represents more than half a million trees, thousands of tons of garbage, and millions of liters of the fossil fuel needed to move this waste to our landfills and incinerators. Event sponsors and partners: BC Housing, City of Vancouver, Vancity Community Foundation, Central City Foundation, Vancity Community Investment, Haebler Construction, UBC Learning Exchange, The Dugout Drop-in Centre Society, Recycling Alternative, United We Can, DTES Street Market, and other anonymous supporters. 1. A person who collects bottles and cans and other objects of value from garbage (in bins); a dumpster diver; The binner pushed a shopping cart full of empties to the bottle depot.